I've been sharing old family photos with my Welsh cousins. Some have been snaps of outings or daily life, and there have been several weddings, the whole party smiling in serried ranks, the bride vying for attention with some impressive millinery. And then there are the posed studio photos, the subjects in their best clothes, sitting or standing just so, solemnly gazing ahead; the photo then sent to distant relatives, an assurance that their absent loved ones were fine and thriving. In an age dominated by selfies and snapped cappuccinos on social media these photos remind us that a century ago, being photographed was an event for which one dressed up and paid, and the images were often framed, lovingly pored over and treasured. The seven siblings were the children of poor peasant farmers; Giovanni was the oldest, and by the time he was fourteen they had lost both their parents in tragic circumstances. The seven were split up: those old enough to do so found live-in work, while the youngest were brought up by relatives until they too were old enough to earn their keep. Life was hard in 1911 rural Italy, and there was little room for sentiment or a prolonged childhood, and no perceived need for more than an elementary education. After Italy entered WWI in May 1915 Giovanni - not yet eighteen - was called up by the army. Nobody would have imagined it at the time, but this was the last time they were all together in the same area. By the time Giovanni was demobbed in 1919 the family diaspora had begun. 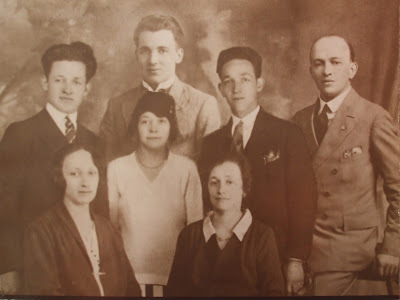 First Tom (in 1916, aged only 16), and later Albino emigrated to South Wales: Giovanni joined them, but soon moved to London, where he met and married my grandmother, finally returning to Italy in the 1930s and dying there in 1942. Meanwhile, the three sisters and youngest brother made their way to France, all settling in Paris. They say it isn't distance which separates people, but silence; and this Magnificent Seven certainly showed the truth of this. They had been physically separated at an early age and ended up living in three different countries; telephone calls and overseas travel were expensive and time off work for family visits ate into precious savings; and yet they somehow managed not to lose each other in their dispersion. Somehow, in between rare visits, they retained an amazing closeness, keeping faith and contact with each other through letters and postcards - and gifts of photos. And in one of those letters must have come the idea which led to this family photo. Look closely at it - click and enlarge it, if your browser permits - and you can see it has been professionally photo-shopped. The four Parisian Dallanegras and Albino (presumably visiting from Wales) were photographed together; the other two UK-based ones added in. You can see the faint lines joining them to each other, immortalising their closeness. After 1915 they were never all together again... except in this photo. If a complete family reunion was an impossible dream, this, at least, was the next best thing: distance, tragedy and poverty may well have separated them, but love and loyalty kept them together.